First of all – What is the Timeline? 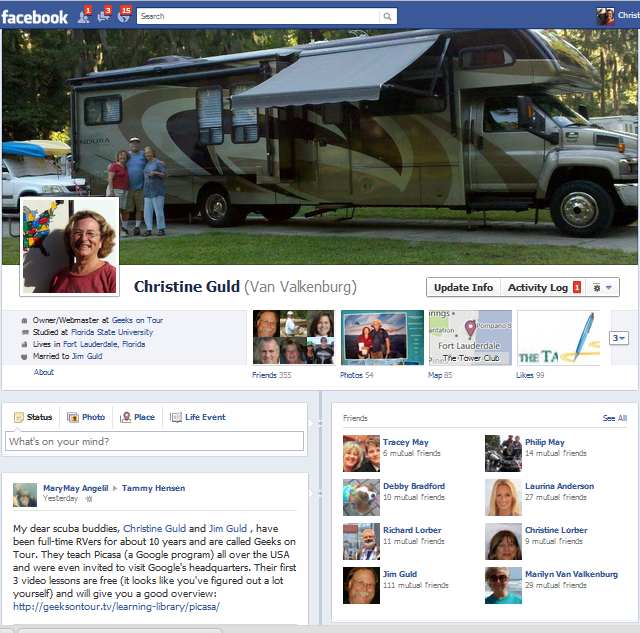 It’s the new layout on your Facebook Profile. Realize that your Profile is not your home page. The Home Page is your News Feed – the place where all the news from your friends shows up. Your profile is just about you. When someone clicks on your name anywhere in Facebook, they end up at your Profile … all about YOU. Do you have Timeline Yet? So, step one for adding a banner to your Timeline is to be viewing your Timeline. Click on your name. If you haven’t yet upgraded to the Timeline your Profile will look similar to the image on the left below. If that’s your situation, the first thing to do is to go to Facebook’s Timeline introduction page and click ‘Get it Now.’ Be aware that this is irreversible. Once you advance to the Timeline layout for your profile you cannot go back. Personally, I love the timeline. I’ve been a journal-keeper since I was a little girl. Facebook’s Timeline is the ultimate journal/scrapbook/photo album of your life, all arranged on a vertical line representing time. At the top is Now, at the bottom is the date you were born. However, as with any change, it takes some getting used to and many people don’t like it. When you first upgrade to Timeline, you won’t have a cover photo. You will see a little button in the space intended for the cover. Click the ‘Add a Cover’ button and then you can choose to upload a picture from your computer, or use one from one of your existing photo albums. Once you’ve selected a photo, you can move it around until it looks good in the space allotted. The picture will be wide … it must be at least 720 pixels wide in order to look ok. If you already have a Cover Photo in place and you want to change it, just hover over the existing picture and you will see a button to ‘Change Picture.’ Click that and you’ll be able to upload a new photo, or pick another one from your albums on Facebook. To learn more about using Facebook, check out our Learning Library of Tutorial Videos for Facebook. 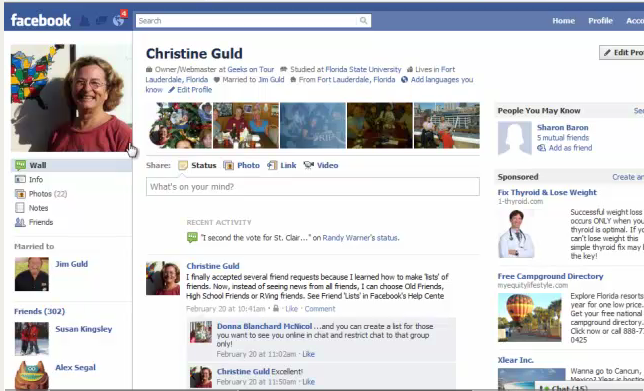 Anyone, even non-members, can watch the lessons on What is Facebook: Your Personalized Online Newspaper. A very important video lesson is the one on Privacy. This one is for Members only. Better yet, register for our Techno-Geek Learning Rally April 22-28 in Bushnell, Florida. You’re guaranteed to learn lots about the Facebook! Published by MrsGeek, in Blog. Tagged with Cover Photo, Facebook, Timeline.